There is a small difference between RANK() and DENSE_RANK() analytic functions. Lets take an example to illustrate this. 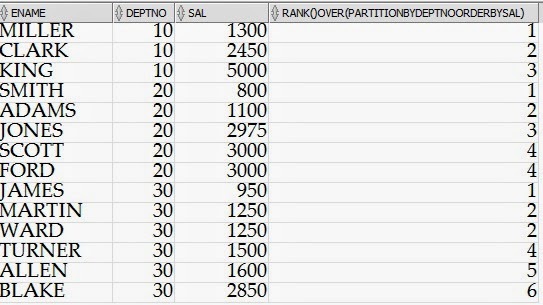 Here DENSE_RANK() returns consecutive number rank like 1,2,2,3,4,5 for dept number ’30’. But RANK() returns rank numbers like 1,2,2,4,5,6. This is the main difference.